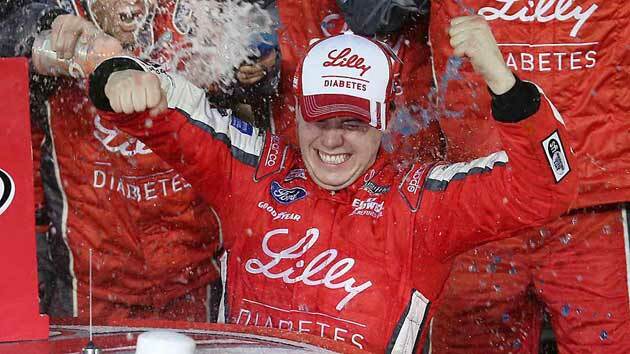 Ryan Reed's Xfinity Series win at Daytona Speedway on Feb. 21 was a victory for athletes who battle diabetes. After crossing the finish line in first place at Daytona International Speedway on Feb. 21 and doing some celebratory burnouts, Ryan Reed managed to get lost on the way to Victory Lane. “I had to ask for directions because I had no idea where I was going,” Reed told SI.com this week. You can pardon Reed, 21, for letting the thrill of victory cloud his sense of direction. His win in the Alert Today Florida 300 seemed incredibly unlikely: Reed had never won a NASCAR national series race, and he was in seventh place with just two laps to go. At that point, Reed says he was just trying to salvage a top-five finish. But he maneuvered to the front of the pack and shot past Brad Keselowski on the last lap to take the lead, capping a thrilling final lap that was marred by a wreck. But what made Reed’s victory at Daytona even less likely was that four years ago he was told that he was never going to be able to race again. In February 2011, Reed was diagnosed with Type 1 diabetes, a chronic disease in which the pancreas does not properly produce insulin. The first doctor he saw told him that his racing career was over, and Reed was crushed. Obviously, Reed’s career didn’t end at that doctor’s office: He found another physician, one who helped him manage his diabetes to the point at which he could compete. Fenway Racing driver’s mastery of his blood glucose levels has allowed him to gain control over his health and compete against the best racers in the world, even under tremendously difficult circumstances. To keep his blood glucose levels from rising too high or falling too low during a race, Reed maintains a strict schedule of eating, exercising and monitoring his blood sugars. At Daytona, his management was impeccable: He started the race at 120 milligrams per deciliter, which is slightly above normal for a non-diabetic individual. Reed aims to have his blood sugar levels start at 120 and trend upwards during the race, ensuring that he won’t drop too low, which could be disastrous. Reed keeps a continuous real-time glucose monitor for his blood sugar level on his dashboard. If it starts to fall too low, he consumes a sugary drink to raise it. But it goes excessively high, one of his pit crew members is trained to give him an insulin injection through his fire suit. Keeping his blood glucose levels within a safe range is challenging, as Reed has to balance the physical demands of racing with the adrenaline surge he experiences behind the wheel. What makes Reed unique is the way that he has made diabetes a part of his identity. His primary sponsor is Lilly Diabetes, which runs a campaign called “Drive to Stop Diabetes.” He's taken pride in becoming an outspoken leader in the diabetic community, which has embraced him in loving solidarity. After he won at Daytona, he was bombarded on social media with comments from fellow diabetics. Reed certainly isn’t the first diabetic athlete to attain success at a high level. Chicago Bears quarterback Jay Cutler threw a career-high 28 touchdowns last season, while cross-country skier Kris Freeman appeared in his fourth Olympics. Swimmer Gary Hall, Jr.—who, like Reed, worked with renowned doctor Anne Peters—won three of his five Olympic gold medals after his 1999 diagnosis with Type 1 diabetes. Bobby Clarke of the Philadelphia Flyers had a Hockey Hall of Fame career that lasted 15 seasons in the NHL. Reed says he couldn’t have won at Daytona without Dr. Peters, who told him four years ago that he could still race as long as he managed his diabetes properly. “I’ll have to send her a replica of the trophy or something, because she definitely deserves it,” Reed says. As Reed was preparing to celebrate on Victory Lane, he removed his helmet and took a moment to collect his thoughts. Four years ago, a cruel disease had suddenly stripped from him everything he loved, and now he had everything he loved and more: a win at Daytona. As he sat in his car, he reaffirmed his belief that his four-year struggle with diabetes—which was extraordinarily frustrating at times—had all been worth it for the sake of this moment. With his blood glucose hovering around 180, he got out of the car to celebrate.